Keeping your business or home office stocked full of computer accessories, storage media, computer cleaning supplies, printer supplies, blank CDs and blank DVDs can mean the difference between success and failure. Make sure you have all of the right printers, hardware and supplies on hand when you need them. 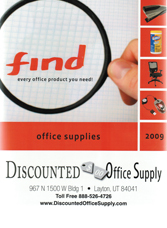 At Discounted Office Supply.com, you’ll find the best prices and selection of office supplies anywhere on the Internet. Our 36 geographically placed distribution centers throughout the continental United States mean you’ll get the product you want at a great price-in no time at all. Browse below for the printers, blank CDs and blank DVDs, cleaning supplies, media management, printer ribbons, and accessories below.